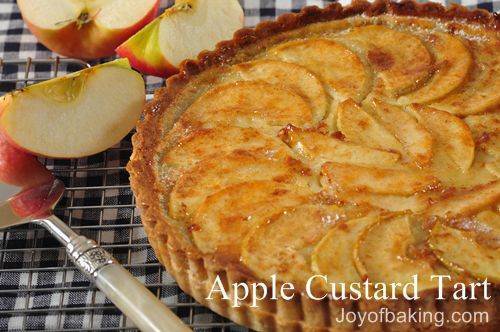 There are so many ways to use apples and this Apple Custard Tart presents them so elegantly. It starts with a pre baked pastry crust that has a rich sweet buttery flavor and a crisp cookie-like texture. Once baked, the crust is glazed with a thin layer of apricot preserves which not only adds flavor but it also acts as a shield to prevent the crust from becoming soft. Once the glaze has dried, lightly sweetened apples are artfully arranged on the tart shell. A rich and creamy custard is then poured over the apples and the tart is baked until the custard has set. The finishing touch is to broil the tart until the tips of the apple slices have nicely browned. Serve with softly whipped cream or vanilla ice cream. As far as the apple filling goes, you can make this Apple Custard Tart with any firm textured apple that will not lose its' shape when baked. Granny Smith, Golden Delicious, Rome and Braeburn are some year round favorites but during the Fall try to use locally grown apples as they have superior flavor and texture, and there is the added bonus of supporting your local farmers. What I often like to do is to mix two or three different varieties of apples which gives the apple pie a wonderfully complex flavor. The custard filling for this Apple Custard Tart has a rich and creamy vanilla flavor. A custard is different than a pudding in that it does not contain cornstarch (corn flour). When you make a custard, the flour, sugar, and eggs are simply whisked together in a bowl. The cream is heated just until boiling, and then it is whisked into the flour mixture until incorporated. The final step is to whisk in the vanilla extract and brandy, if using. Because the flavor of the custard depends on the vanilla extract, it is best to use "pure" vanilla extract, not the imitation extracts as they are made with synthetic vanilla (from glycoside found in the sapwood of certain conifers or from coal extracts) and leave a bitter aftertaste. Sweet Pastry Crust: Place the butter in your mixer and beat until softened. Add the sugar and beat until light and fluffy. Gradually add the egg, beating just until incorporated. (Don't over mix or the butter will separate and lighten in color.) Add flour and salt and mix just until it forms a ball. (Don't overwork or pastry will be hard when baked.) Flatten dough into disk, cover with plastic wrap, and refrigerate about one hour or until firm. Have ready an 8 - 9 inch (20 - 23 cm) tart pan with removable bottom. On a lightly floured surface, roll out the pastry into an 11 - 12 inch (28 - 30 cm) circle that is about 1/8 inch (3 mm) thick. To prevent the pastry from sticking to the counter and to ensure uniform thickness, keep lifting up and turning the pastry a quarter turn as you roll (always roll from the center of the pastry outwards to get uniform thickness). When the pastry is the desired size, lightly roll pastry around your rolling pin, dusting off any excess flour as you roll. Unroll onto top of tart pan. Never pull pastry or you will get shrinkage (shrinkage is caused by too much pulling of the pastry when placing it in the pan). Gently lay in pan and with a small floured piece of pastry, lightly press pastry into bottom and up sides of pan. Roll your rolling pin over top of pan to get rid of excess pastry. With a thumb up movement, again press dough into pan. Prick bottom of dough (this will prevent the dough from puffing up as it bakes). Cover and refrigerate for about 20 minutes to chill the butter and to rest the gluten. Preheat oven to 400 degrees F (205 degrees C) and place rack in center of oven. Line the unbaked pastry shell with parchment paper or aluminum foil. Fill tart pan with pie weights or beans, making sure the weights are to the top of the pan and evenly distributed over the entire surface. Bake crust for 20 to 25 minutes until crust is dry and lightly browned. Remove weights and cool crust on wire rack. When cool, spread a thin layer of warm apricot glaze over the bottom and sides of the tart to seal the crust and prevent it from getting soggy. Let the glaze dry between 20 - 30 minutes. Apricot Glaze: In a small saucepan heat the apricot preserves until boiling. Remove from heat and strain to get rid of lumps. Add the Cognac or water. Custard: In a large bowl whisk the flour and sugar together. Mix in the eggs and stir with a wooden spoon to make a smooth paste. Do not let this mixture sit too long as it will form a crust. Meanwhile, in a small saucepan over medium heat, heat the half-and-half until it just starts to boil and the cream foams up. Remove from heat and gradually whisk into the egg mixture, stirring constantly. Whisk in the vanilla extract and Apple Brandy, if using. Set this mixture aside while you prepare the apples. Apples: Peel, core, and slice the apples into 1/4 inch thick slices. Melt the 2 tablespoons (26 grams) butter in a large skillet over medium heat and stir in the 2 - 4 tablespoons (25 - 50 grams) sugar. Add the apples and saute until they begin to soften, approximately 5 - 10 minutes. Set the cooked apples aside. Assemble Tart: Preheat oven to 350 degrees F (177 degrees C) and place rack in the middle of the oven. Arrange the apple wedges in concentric circles on top of the cooled and glazed tart shell. Carefully pour the custard over the apples to just below the top of the tart pan (do not fill all the way or the custard will drip between the crust and the pan). Sprinkle lightly with the Cinnamon Sugar. Let the tart cool on wire rack, then lightly sift powdered sugar over the top. Place the tart under the broiler in the oven just long enough to caramelize the sugar on the apples. To prevent the edges of the tart shell from over-browning, you can cover them with a thin piece of aluminum foil or pie shields. Be careful not to over brown. To remove the tart from the fluted sides of the pan, place your hand under the pan, touching only the removable bottom not the sides. Gently push the tart straight up, away from the sides. The fluted tart ring will fall away and slide down your arm. If you want to remove the bottom of the pan, run a knife or thin metal spatula between the crust and metal bottom, then slide the tart onto a cardboard cake round or platter. Makes 1 - 8 or 9 inch (20 or 23 cm) tart. Friberg, Bo. 'The Professional Pastry Chef'. Third Edition. Van Nostrand Reinhold. New York: 1996.